Plans to re-open Skye’s airport have received a major boost after a new study showed it would be worth millions of pounds to the local economy. 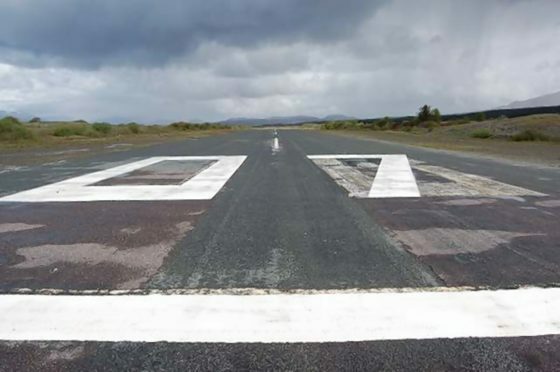 A business case for reinstating passenger flights to the Broadford Airstrip found that the benefits would far outweigh the costs. The analysis showed that reviving the airport could be worth up to £46.8million to the Hebridean island and the wider area over the next three decades, at a cost of between £19.4million and £23.1million. Councillors on the island have now been urged to back the ambitious proposal at a meeting of the Skye and Raasay committee in Portree on Monday. The air strip at Ashaig, was opened in 1972 to serve as a gateway to the island, with Loganair operating a scheduled route to Glasgow from 1972 to 1988, when the service was disbanded. Calls to re-open the airport have been growing louder in recent years, and island campaigners were delighted last night by the findings of the draft business case and the recommendation from council chiefs. But one leading figure suggested the report may even understate the local economic benefits. Shirley Spear, who owns the celebrated The Three Chimneys restaurant at Dunvegan, has been one of the prime movers behind the FlySkye campaign. She said: “I would say the figures quoted are quite modest and that in reality it could be even more successful. “It is not just going to affect tourism. It’s for the whole social economy of Skye, the surrounding islands and the mainland. “The wider area will benefit enormously from having this connection to the central belt. Mrs Spear pointed out that next month it would be four years since they started this campaign. She said: “It has been quite a long slow process to get to this stage. “We’re really pleased that it has been so well received by the council. The draft business case report on Skye air services was commissioned by regional transport partnership Hitrans as a collaborative study involving Highland Council and Highlands and Islands Enterprise. It looked at two options for providing a service between Broadford and Glasgow – using nine-seat Islander or 19-seat Twin Otter aircraft. The main difference between them was found to be the size of the terminal and aprons needed to accommodate the different sized aircraft. The report concluded that the larger Twin Otter option would cost less to set up and bring more benefits. The costs of reopening the airport include capital and operational expenditure, maintenance and airline subsidies. The socio-economic benefits include journey time savings, overnight stay savings, Gross Value Added impacts and increased inbound tourist spend. But council chiefs added that the project would be “unaffordable” for the local authority alone, and would require Scottish Government support. The full final report, along with options for how the project could be moved forward, is to be presented to a future meeting of the council’s planning, development and infrastructure committee. Ross, Skye and Lochaber MP Ian Blackford, who was also one of the original FlySkye campaigners, was also delighted at the recommendation that councillors support the project. He said: “I think the report demonstrates that there’s a really strong economic case for the airport and that it is something that would help benefit local people and businesses and help develop the tourist trade on a year round basis for Skye and West Ross. He added that he believed Twin Otter aircraft would be needed as there would be strong demand for seats.